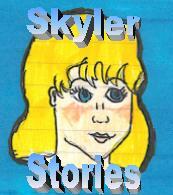 This page is for my comments on my abandoned novel, which was given the working title "Skyler Stories." Overall writing it was a learning experience, but even though the writing was better than in my first novel, I still didn't really have a hang of how to tell a story. You might have to read the excerpts to decide if you agree with me, but you may want to save yourself the pain and take my word for it. That said, here is a little discussion of what I did badly and what I did right. I'm pleased that Skyler's family structure was different from mine. Too much of the time I've modeled characters after myself, so I was pleased to see that this was a family in which the main character was the youngest (I'm the oldest) she had brothers and sisters (I only have sisters), and her parents are separated (mine are now separated, but when I wrote this they were happily married). They are also from a Christian background and Skyler has to go to church, which is foreign to me. I worked in the whole "telepathic character in an otherwise normal world" thing pretty well. It's not pointed out all the time that OMG SHE'S READING SOMEBODY'S MIND because, well, she always is, so it filters into her observations constantly. You don't really bat an eye when she gets startled when someone else gets hurt, or when she reacts to someone's anger even if they didn't say a thing. The dialogue is starting to improve. Dialogue is currently one of my best skills, I think, and you can kinda see that it's shaping up here. Skyler talks to the reader. All the time. This is bad. Skyler's random moodiness gets on my nerves. It's understandable, I guess, because she doesn't have a very fun life and on top of that she's in frigging middle school, and who isn't moody in middle school? But still, she just seems so bitter sometimes, like in the excerpt where she's thinking about why her eldest sister is eating with them that night and she makes pessimistic guesses about it and concludes that her sister thinks she's too good for them. Sometimes she really just does not seem like a very nice person. I invented lots of weird friends for Skyler's boyfriend Jason in this book. They are not featured in any of the excerpts because they're just plain too dumb and I'm embarrassed to share. Anyway, I invented all these people and they all had idiotic hip nicknames, and when my sister read the book she pointed out that if there were so many people who were so DIFFERENT from each other then . . . why were they all hanging out in the same crowd, anyway? Well, I guess the real reason is that I like inventing people and throwing them together as a fun-loving rag-tag bunch, duh! But in response to that comment I tried to develop some kind of dumb underlying reason why these people were held together by circumstance. See, now, the correct response is to look at what you did that was stupid and erase the stupidity, not go deeper into it by trying to make up contrived reasons why your stupidity is justified. I've kinda learned that since. Meh. There is a scene (also not featured in these excerpts because it's too embarrassing) in which Skyler goes to the fair with her new boyfriend and meets his cousin, Brad. And when she meets her boyfriend's cousin, she is unable to miss the fact that he happens to be telepathic like her (which isn't all that strange considering some weird genes are running through their family tree and her boyfriend has a psychic talent himself). But what I thought was really, really messed up was that Jason didn't know it. He didn't know that his cousin was telepathic. Even though he knew that his dad had a weird talent and that his grandmother did, he didn't know about his cousin. Why? There's an idiotic part of the book (also not included) in which Skyler's mom reveals that she did some things as a kid that made her think she knew what people were thinking. It makes no sense that the people involved in finding that out just kinda shrugged and said "Hmm, that's weird" and went on with life. Especially Skyler's mom. Until they talk about it later and Skyler admits to being able to tell what's going on in people's heads sometimes, her mom doesn't seem to think much about the possibility that the whole thing is real. Oh-ho, yes, remember that time when your brother broke his arm and you woke up crying before he came in to tell us? Boy, that was weird, wasn't it? I'm sure it didn't mean a thing. Wow I'm thick!